It's well known that we have lost over half of our breeding cuckoos during the last twenty-five years. Populations of many UK breeding migrant species are declining, however, there is little known about the mechanisms of these declines. Climate change is causing the timings of the spring season to change and there is evidence that many migrant species are not advancing their arrival times sufficiently to track the earlier spring. There is also some suggestion from previous studies that there are constraints in the migration timing of species wintering in or beyond the humid zone in Africa. We also know from the BTO/JNCC/RSPB Breeding Bird Survey that Cuckoos are doing better in some areas of the country than in others, with the decline in England (68%) being greater than in Scotland and Wales, but why are they are declining at the rate they are? Clearly we need to understand all aspects of the Cuckoo’s annual cycle before we can begin to suggest what might be driving the decline. Whilst the Cuckoo had been well studied during the breeding season here in the UK, once they head off on migration very little was known about the routes they take or where in Africa they spent the winter months. Previous to this project, there had only been one recovery of a young bird that was found in mid-winter in Cameroon - 82 years ago. 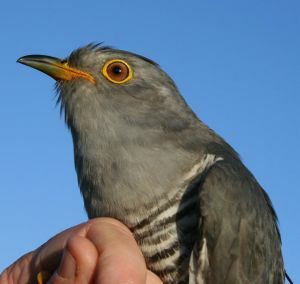 If we could identify areas of importance for these birds, then we can study pressures there which could explain the losses of the British Cuckoo. The recent development of new 5g tags meant that we were able to track this species. In an effort to learn more about the routes and stop-over sites used, our first five British Cuckoos were fitted with satellite-tags in May 2011. See how we caught the Cuckoos. The tags are solar-powered, transmitting for 10 hours and then going into 'sleep' mode for 48 hours, to allow the solar panel to recharge the battery. Read more about the tags here. So far all of the cuckoos we have tagged, except for one female - Idemili, have been full grown males. This is because they are generally larger than females and juveniles and so are able to carry the tags more easily. Once smaller tags are available, we hope that we will be able to tag females and juveniles. We look forward to learning how their migrations differ from the males we have tracked so far. Information gleaned from the project will help to form conservation strategies and initiate action. Read about what we have already learnt from the project and view a summary of our published research paper on how Cuckoo declines are linked to different migration routes taken to Africa. We have learned a lot about the routes taken by our satellite tagged Cuckoos, and some of the pressures they face whilst on migration, but we now need to look more closely at how dependent they are on, and how much their migration is linked, to the drought-busting rains of the weather frontal system known as the Inter Tropical Convergence Zone (ITCZ) as they move out of the Congo rainforest and begin to head back to the UK via West Africa. With the UK population of the Cuckoo rapidly declining and failing to advance its arrival back here each spring, the prime focus will be on the apparent dependence of the Cuckoo, and the resources associated with this frontal system (ITCZ) in tropical Africa. In 2013 we made a video to promote and explain the project, which may be viewed below. Thank you to all the individuals, organisations and companies have joined in to support this exciting project. We greatly apprecaite all those who have made the project possible, including those who gave advice and volunteers. What have we learnt so far?